Adobe has announced the new Creative Suite 5 and, with it, major new versions of each of the core applications in the suite, including Photoshop, Illustrator, Flash, and After Effects. They include a wide variety of improvements, from enhanced image editing capabilities in Photoshop to new rotoscoping tools in After Effects--not to mention iPhone application development right within Flash. With the release of Creative Suite 5, Adobe is also making several resources available for educators, including new learning materials, curricula, and certifications. The new curricula focus on video production, graphic design, and designing for the Web. All are one-year programs that, according to Adobe, align with NETS-S standards published by the International Society for Technology in Education (ISTE). Digital Video: Foundations of Video Design and Production. In addition, two certification programs for teachers and students (and others) will be offered by Adobe and Certiport: Adobe Certified Associate (an entry-level certification) and Adobe Certified Expert. Two types of training for Creative Suite 5 will be offered by Adobe: in-person workshops and online tutorials provided by Total Training. Of the new applications in Creative Suite 5, Photoshop itself has probably received the largest number of crowd-pleasing new features and has especially built up anticipation for the new "content-aware" fill and spot healing tools. But briefly, the major new features include Content-Aware fill and spot healing, which allows users to remove elements from scenes with a few clicks. 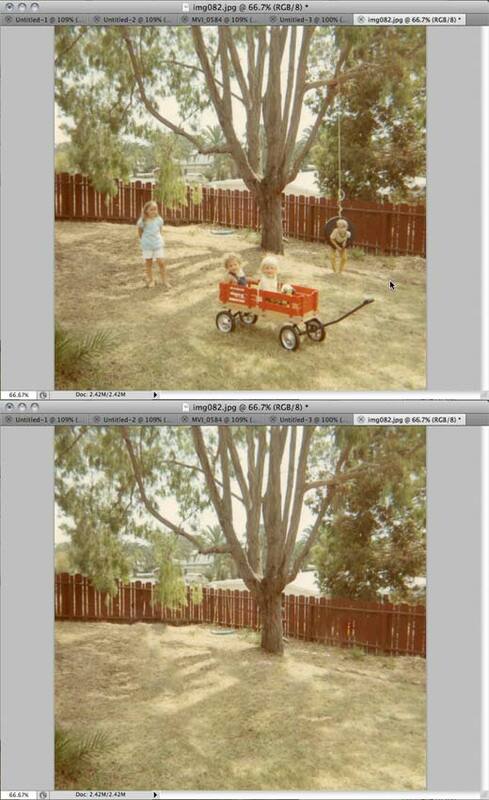 Before and after: Photoshop CS5's content-aware functionality brings significant improvements to the Spot Healing brush. It also adds bristle-style brushes and an entirely new brush type, a "Mixer Brush" that's designed to emulate traditional paint tools, with control over the "wetness' of the brush and the amount of paint applied to it. Again, a more detailed look at Photoshop CS5 can be found here. But Photoshop isn't the only design application in CS5 to receive a major update. Adobe Illustrator, though a far more mature piece of software than Photoshop, has gained some significant new features in the area of creative tools, along with some of the usual workflow and productivity enhancements. Most notable on the creative front is the new Bristle Brush feature, which allows users to paint with vectors in a way that's similar to pixel-based paint tools in other graphics applications. Bristle Brush in Illustrator produces a painterly stroke with a choice of tip shapes and sizes, along with customizable bristle parameters, including length, density, thickness, opacity, and softness. Several other improvements have also been made to Illustrator's drawing tools in general, including improved corner handling; variable-width strokes that allow users to adjust the width of the stroke at any point; improved handling of dashed lines, including automatic adjustments to make dashes symmetrical; improved control over arrowheads; and new options for controlling how art brushes and pattern brushes scale along a path. The other major new addition to Illustrator's creative feature set comes in the form of perspective grids. Mildly akin to Photoshop's Vanishing Point, perspective grids in Illustrator allow users to position and manipulate some types of objects along a 3D grid. 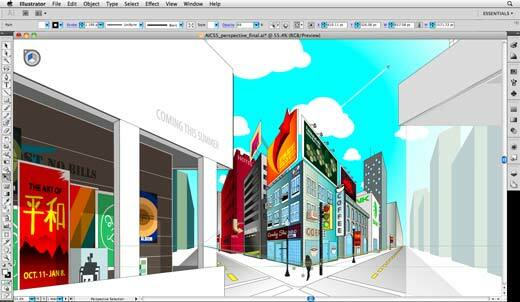 Support for adding interactivity to Illustrator artwork using the new Flash Catalyst. Like Photoshop CS5 Extended, After Effects CS5--a standard in the toolchest of motion graphics professionals--is being released as a fully native 64-bit application, allowing it to support extremely high resolutions and color depths that were impractical in a 32-bit application. As an example, Adobe said, the 64-bit After Effects CS5 using 32 GB of RAM will allow real-time RAM preview of up to 34.9 seconds of 1,920 x 1,080 video at 32 bits per color channel and 23.976 frames per second (compared with 2.3 seconds in After Effects CS4). 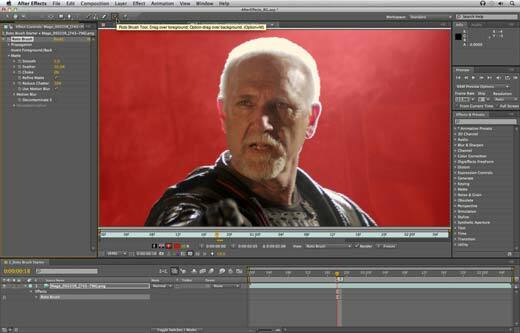 On the utilitarian front, After Effects CS5 adds a new tool called Roto Brush, designed to simplify masking drastically using enhanced region selection technologies. With the Roto Brush, users define an inside selection and an outside selection on a single frame and set various edge parameters. After Effects calculates the mask for subsequent frames automatically, while also allowing for frame by frame modifications to the selection. Improved Photoshop file format support, including adjustment layers and extruded layers. On the Web front, Flash Professional CS5 will allow Flash developers to build new applications for the iPhone or repurpose applications that had previously been built for the Web using ActionScript 3. The process involves exporting the project from Flash Professional to a native iPhone format (.ipa). There is no JIT or runtime interpretation for the finished application. 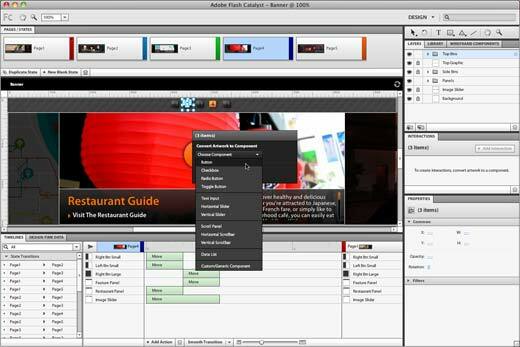 Support for iPhone app authoring isn't the only new feature coming to Flash CS5. It also adds a significantly revamped text engine built on the Text Layout Framework, bringing typographical control similar to that found in traditional graphic design tools. It includes support for everything from kerning, leading, and tracking to ligatures and discretionary hyphens. It also adds support for flowing text across multiple columns, threaded text boxes, text wrap, inline images, and linked images. Multilingual typographic and layout features are also supported. The inverse kinematics system has also been improved in Flash CS5 with the addition of a dynamic physics engine with control over the "spring" of a bone element, including strength of the spring and resistance. A new Code Snippets panel. The remaining updated applications in the new Creative Suite 5 received more mild makeovers generally, with performance and workflow refinements, along with some new features or feature enhancements, but nothing as major as the improvements that came to Photoshop, Illustrator, After Effects, and Flash Professional. The Creative Suite also includes a new application called Flash Catalyst, a tool that's intended to allow designers not terribly familiar with Flash (e.g. 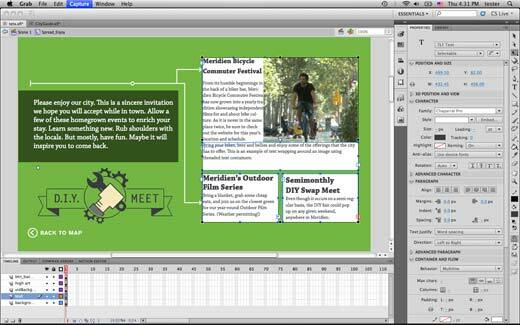 print designers) to create interactive graphics without coding. Using Flash Catalyst, designers can convert Photoshop, Illustrator, and Fireworks images into fully interactive, finished Flash files. Flash Catalyst CS5 lets users create Flash files without coding. Adobe Creative Suite 5 will be available within a month, with single-user licenses starting at $299. Education pricing will also be available, including new discounts for home use for teacher and student editions, according to Adobe. The company also indicated that institutional education pricing will be more affordable than the pricing of previous editions.